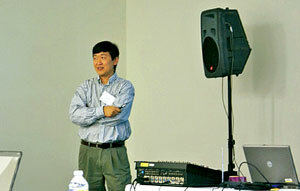 A major set of EMC workshops preceded the 2009 IEEE International Symposium on EMC in Austin, Texas. 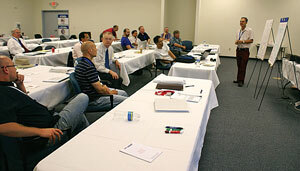 The August 15–16 workshops held at ETS-Lindgren in Cedar Park, Texas focused on describing the new edition of ANSI C63.4 on emission measurements for product compliance and ANSI C63.5 on antenna calibrations including introducing time domain techniques for calibration and then using those antennas for chamber validation. These workshops are a continuation of other workshops, largely on training in the use of C63.4. These workshops are designed for those interested in learning the latest in standardization who will be attending the annual IEEE EMC symposium. 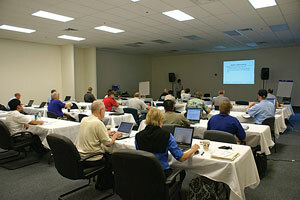 See the article below for more information on these two well-attended workshops in Austin. A more realistic measurement of RF power line filter characteristics is presented in the overview of IEEE Standard 1560, “Standard for Methods of Measurement of Radio Frequency Power Line Interference Filter in the Range of 100 Hz to 10 GHz” shown below. The working group for this standard meet in Austin during the EMC 2009 symposium to further their work on this important standard. 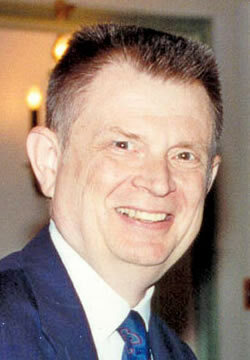 Two working group members that were instrumental in the development of this standard are Kermit Phipps and Philip Keebler. ­Kermit is a member of the EMC Society Standards Development Committee and Phil is a member of the Working Group for the standard. The associate editor also provided inputs in his review of their article. This standard has many applications and, according to Kermit, it is being used more frequently than in the past due to the need to better specify the impedance of such filters for use in very sensitive applications. This, and more, is noted in the article below. Lastly in this column, we have the article titled “TC-3 Electromagnetic Environment: From Sun Spots to 10 kHz” by Dave Southworth, Chairman of TC-3. TC-3 is one of the Technical Committees of the IEEE EMC Society. 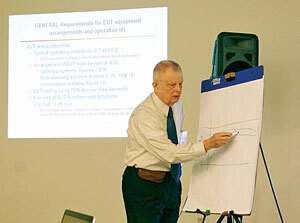 The committee held a meeting in Austin during the EMC 2009 symposium to discuss IEEE Standard 473, “Recommended Practice for an Electromagnetic Site Survey (10 kHz to 10 GHz)” and plans to update the standard starting in November 2009. In summary, this column continues to be devoted to EMC standards activity including recent workshops and publications on EMC standards as well as reviewing standards which are already in use by industry. I hope you enjoy the three contributions below. The C63.4 workshop was presented by Don Heirman (Don HEIRMAN Consultants) and Bill Hurst (FCC Laboratories). Bob Hofmann could not participate due to medical reasons (he is on his way to recovery). Bill Hurst of the FCC explains the new material on spectrum analyzers found in ANSI C63.4. Fifteen students attended this full day workshop on August 14.
shown demonstrating the solution to the problem. teams during their problem solving session. 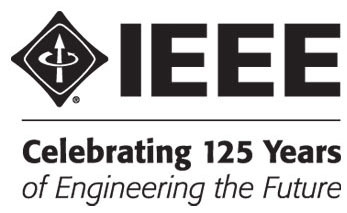 IEEE EMC Symposium in Austin. showing application of the technique for site attenuation. The C63.5 and Time Domain Measurements workshop on August 15 was presented by Dennis Camell of NIST, Mike Windler of UL, Zhong Chen and Mike Foegelle of ETS-Lindgren, Jeff Poole of Agilent Technologies, and Greg Kiemel of Northwest EMC. The speakers presented the review of ANSIC63.5-2006 and the time domain technique for measuring test site validation using calibrated antennas. 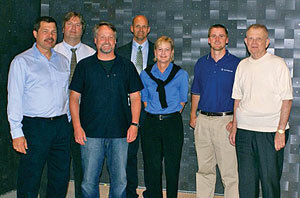 Organizers of the ANSI C63.5 and Time Domain Measurements Workshops included (from left): Dennis Camell of NIST, Michael Foegelle of ETS-Lindgren, Greg Kiemel of Northwest EMC, Mike Windler of UL, Janet O’Neil of ETS-Lindgren, Jeff Poole of Agilent Technologies, and Don Heirman of Don HEIRMAN Consultants. The practical demonstration was especially illustrative as the instructors showed that the technique not only is quite accurate for the purpose, but will find those areas in a chamber where absorber improvement is needed. This was demonstrated by putting a piece of tin foil on one of the absorber tips and “finding” it via the validation technique. If this were a deficiency in an absorber (or maybe a void in the absorber placement where the metal wall of the chamber was exposed), corrective action at that point could be made. 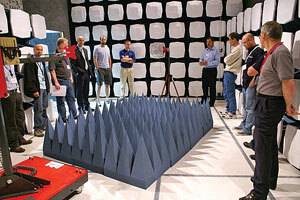 Such an action may be increasing the absorber efficiency or filling in the void in the absorbers. Twenty-one students attended this full day workshop on August 15. All in all, the students were treated to two intense days of training from widely recognized experts who in addition contributed to the text for the standards. C63® thanks again ETS-Lindgren which provided the meeting venue and use of their semi-anechoic chamber and both UL and Agilent Technologies for donating the lunches which were brought to the meeting room to allow more time to be spent on the training. The ANSI C63.4, ANSI C63.5 and time domain measurements workshops are planned to be given next year either independently and/or just before the start of the 2010 IEEE International Symposium on EMC in Ft. Lauderdale, Florida. 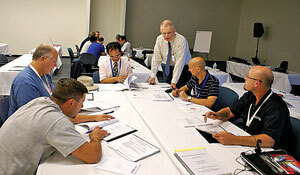 Please check the C63® website – www.C63.org – after January 2010 for more information about scheduled ANSI C63® workshops in 2010.